Locals in Bilbao are divided on whether it is a 'beauty' or a 'beast', but the bizarre multi-million dollar Guggenheim Museum, opened in 1997, has brought thousands of visitors flocking to the city to be awed or floored. The massive museum, designed by the famous Frank Gehry, has no right angles, resembles a metallic flower clad in shiny titanium, and is situated in the former dockyard alongside the Nervion River. There are also some huge, striking sculptures outside the museum and many visitors consider the exterior the highlight of a visit. Inside, apart from breathtaking and unusual spaces, the museum houses the works of some important 20th century artists, including Picasso, Robert Rauschenberg, Andy Warhol, Willem de Koonig and Clyfford Still. There are also sections displaying the work of young Basque and Spanish artists, and rotating exhibits lent by the Guggenheim museums in New York and Venice. There is a great cafe in the Guggenheim and a bookshop. It is a good idea to book your tickets in advance online to get a slight discount and to jump the queues at the entrance. 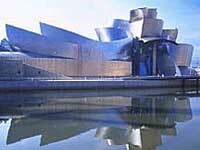 The Guggenheim is undoubtedly one of Bilbao's greatest and most popular attractions and shouldn't be missed. Opening times: Open Tuesday to Sunday from 10am to 8pm (open on Mondays between July and August). Admission: €11(adults); free for children under 12. Concessions available.